APR - APR Motorsport is readily available here at VRS. 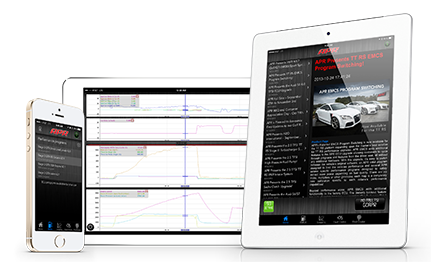 We've teamed up with APR to bring you, not only the best ECU software money can buy thats leaps and strides ahead of any other tuner, but bringing with that software hand in hand our knowledge and expertise in VAG tuning, to create a truly un-rivaled package. As well as the ground breaking software from APR we also bring to you the entire range of APR hardware, legendary exhaust systems, to the best High Pressure Fuel Pumps on the market, and everything in between. If you have ever thought about tuning, APR is the only product you need to get the most out you're car. Knowledge is power, we have the knowledge, you can have the power. EMCS is APR's revolutionary patented Enhanced Modular Chipping System. EMCS is an industry leading technology that brings many new features to the automotive enthusiast. This technology was developed exclusively by Audi Performance & Racing, LLC and demonstrates APR's continued commitment to lead the industry with the most technologically advanced products available. Want chipped mode? Want to be able to switch back to your stock settings? Want a race mode to run 104 Octane fuel at the track? How about a valet mode that limits power? EMCS is the lone technology on the market that can give you all of these options. No changing of the chip or ECU is required. These programs are available at the touch of a button. Other companies have attempted to imitate EMCS with clumsy external switching devices that only replace portions of a "base" calibration. EMCS is still the only Bosch Motronic Engine Management System enhancement that gives the ECU the ability to completely rewrite the entire operating map data when selecting different programming options. This allows for completely new and independent calibrations for each program selected giving you the best, most powerful and complete Stock Modes, 95, 98 and 104 Octane Performance Modes and Valet Modes. APR's EMCS features and program modes are activated via your OEM cruise control buttons for ease of use and stealth. Your cruise control will continue to function as normal, but will give you the ability to scroll through the programs you have purchased with your APR ECU Upgrade. The procedure is simple and involves only two steps. All APR ECU Upgrades are fully encrypted to prevent theft of our valuable and proprietary coding information by lesser companies.All APR ECU Upgrades include a limited lifetime warranty against defects in the software and to provide free updates and reflashes as they become available. Installation may be additional and is not included in the warranty. All APR ECU Upgrades offer a 30 day money back guarantee with no questions asked. If for any reason you are unhappy with your APR ECU Upgrade you may return the upgrade to your place of purchase for a full refund provided you are within a 30 day period from your time of initial purchase. Installation is not included in the guarantee and is at the discretion of the place of install. Should the need ever arise, where available APR's existing EMCS program switching features still remain conveniently accessible through the OEM cruise control stalk.